The State of California mandates all coaches successfully complete a coaching education course by the first day of coaching high school athletics. A school/district may use a coach that has not completed, but working toward completing the Coaching education requirement in an emergency only • Coaches can complete the coaching education requirement online at either www.nfhs.com or www.HumanKineticsCoachEducationCenter.com • All cost for the course is the responsibility of the individual coach • Completion certificates must be faxed to the LAUSD Athletics Office at (213) 241-5847 • Any coach who fails to complete the requirement in the prescribed time will not be allowed to coach the following season until he/she completes the requirement. As of December 31, 2008, it will be mandatory for all coaches in the State of California to meet the Coaching Education Requirement by the end of your first season of coaching, CIF Bylaw 22 B. (9) TITLE V All public school teams must be coached by a person who meets the requirements of the California Education Code and the California Code of Regulations, Title V. Anyone in a paid coaching position must possess valid First Aid and CPR cards by the first day of after-school practice, as determined by the LAUSD Athletics Office. The First Aid and CPR Certification must be acquired from the American Red Cross or the American Heart Association. All coaches are required to sign and retain the new Coach's Code of Conduct, with a copy to be kept on file at the school. For LAUSD only, all volunteer coaches must have a current Volunteer Assistant Application on file at the school and must be fingerprinted & cleared prior to assisting at any LAUSD school. The LA84 Foundation and Human Kinetics Coach Education in conjunction with the California Interscholastic Federation (CIF) are pleased to offer online training for high school coaches in the CIF Los Angeles City Section. 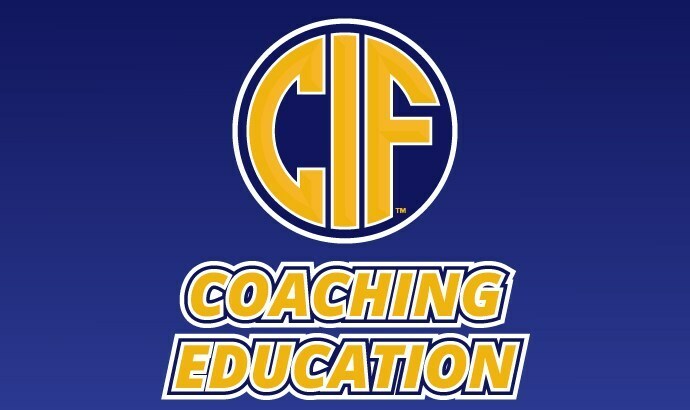 Through funding provided by the LA84 Foundation, the first 400 coaches in the CIF LA City Section over the course of the school year can purchase the course at the discounted price of $18 (a $20 savings).